Interclub Event Confirmed – LCQ Karting Club and PSL Montréal! (Quyon, QC) Le Circuit Quyon (LCQ) is pleased to confirm that it will be hosting an interclub karting event on Sunday, July 26th. Racers from PSL Montréal (ICAR) will be making the trek to Canada’s Capital Region to compete head to head against members of the LCQ Karting Club in Round #6 of the Ottawa-Gatineau Karting Championship (OGKC). The PSL Montréal racers will be bringing their Mini ROK and Briggs powered karts to challenge the seasoned club racers at LCQ. The Briggs & Stratton Masters and Senior races will be included as part of the the Briggs & Stratton Weekly Racing Series (WRS). Round #5 of the OGKC will be held at PSL Montréal’s home track at ICAR at the start of July. More information will be provided as race-day approaches! Get in on this fantastic interclub event! Vincent became interested in karting in 2012 after watching the racing action at Le Circuit Quyon. He knew he had to get himself into competitive racing so he picked up a used kart and the rest, as they say, is history! He started racing competitively in 2013 at the age of 12, taking 4th position overall in the National Capital Kart Club (NCKC) championship. In 2014, he made the move to the Ottawa-Gatineau Karting Championship (OGKC) and finished a competitive 2nd place in the Briggs & Stratton Junior category. He missed out on the overall crown by less than 70 championship points. His favourite tracks are his home track (LCQ) located in Quyon, Québec and the PSL Circuit ICAR track located in Mirabel, Québec. He really enjoys racing at LCQ, as there are several track configurations available that offer challenging and varied racing. Vincent finished 3rd at the inaugural Circuit ICAR race in 2014, and really looks forward to racing there again this year! Vincent’s favourite racers are both local competitors in the OGKC, and also members of Team LCQ. He enjoys watching James Dunn tear around the track in the Briggs & Stratton Masters category, and hopes to soon be racing against Charlotte Lalonde in Briggs & Stratton Seniors. James finished 4th overall in the 2014 Masters standings, while Charlotte was crowned the Senior champion. 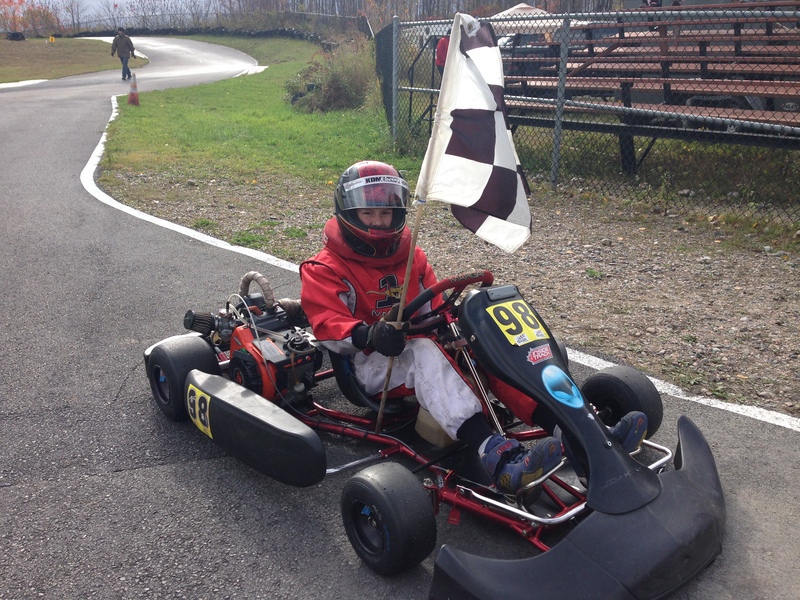 For 2015, Vincent is determined to win the overall OGKC Briggs & Stratton Junior Championship! He will experience some really challenging racing this year – this category is expected to be extremely competitive. Look out Juniors – Vincent has a plan, and his plan is to win win win! 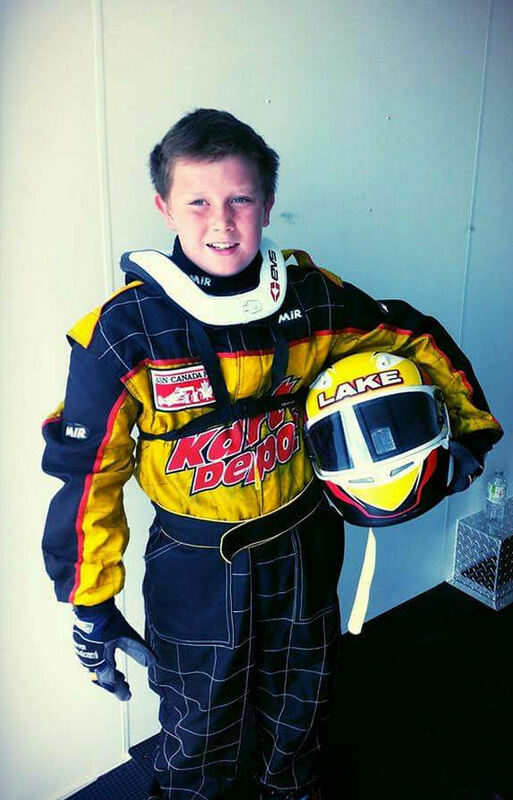 Ashton started karting after going to an open house event; when he saw real racing karts for the first time, he developed an immediate interest. As soon as he hit the track, he knew that he had a need – a need for speed! He absolutely loves racing for the thrills and the fun! He started his racing career at the age of seven at the Lombardy Karting Club, and moved over to the OGKC the following year. In 2014, he was thrilled to experience races at different locations such as Le Circuit Quyon (LCQ), Mosport International Karting, and PSL’s Circuit ICAR at Mirabel, Québec. His favourite tracks are his home track (LCQ) located in Quyon, Québec and Mosport International Karting, located in Bowmanville, Ontario. Ashton really enjoys LCQ for the fun and challenging corners as well as the numerous track configurations, and loves Mosport for its high speed and the length of the track. Ashton’s favourite racers are both local competitors in the OGKC. He enjoys getting out on the track with Owen Clarke, the 2014 OGKC Briggs & Stratton Junior Champion, as well as Brian McCracken, a top contender in the OGKC Masters category! This year, Ashton will be racing head-to-head against Owen for the Junior championship! For 2015, Ashton is really excited to be graduating to the Junior category. He is looking forward to the new challenge of competing against some older and more seasoned racers, while also focusing on improving his passing and rolling starts. This year’s Junior category should be fun fun fun! Look out Juniors – Ashton is in it to win it! (Jacksonville, Florida) The 2014-15 winter season has proven just too long for Margay Racing Canada kart driver Charlotte Lalonde. For 2015, Charlotte is planning on challenging for victory in several different series: the Ottawa – Gatineau Karting Championship (OGKC), the Briggs & Stratton Weekly Racing Series (WRS), the Eastern Canadian Karting Championship (ECKC), and last but not least, the ultimate Crown – the Canadian National Karting Championship. In preparation for her upcoming assault on the 2015 season, Charlotte recently travelled to Jacksonville, Florida to compete in Winter Races #5 and #6 of the Florida Pro Kart Series (FPKS). For the races in Florida, Charlotte was not only supported by her father and Le Circuit Quyon (LCQ) track owner Paul Lalonde, but also received trackside support from Mike & Mike Greiner of Mikim Motorsports of St. Augustine, Florida. Mikim Motorsports is the authorized Margay Racing dealer covering the south-eastern region of the United States. The FPKS winter racing action was held at the 103rd Street Sports Complex, a track with several decades of racing heritage and owned by the City of Jacksonville, Florida. The format of each event started with a qualifying session, followed by two heat races, then a final for all the marbles. Charlotte’s first day back in her Margay started off extremely well, qualifying 3rd out of 14 racers, and missing pole position by a mere 1/10th of a second. Charlotte ran in the top two for the majority of Heat #1; however, on the penultimate lap, she had a coming-together with another competitor and tumbled down the order to finish in 10th. For Heat #2, Charlotte kept it fast and clean and ended the race right where she started – in 3rd place. In the final, Charlotte was battling for 2nd place for the first half of the race, fell back to 7th, then dragged herself back up to 5th by the end of the race. The final was close pack racing, with the top five racers being separated by only 0.6 seconds. On day two, Charlotte put her kart on the 3rd row of the grid, qualifying in 6th position. To put the competitiveness of the racing into perspective, she missed pole position by only 0.3 seconds! In Heat #1, Charlotte made her way up to 4th and hung onto the lead pack for the rest of the race. For Heat #2, she had a fantastic overall race charging into 1st place on the final lap, leading the pack over the finish line and taking her first race win of the 2015 racing season! In the final, Charlotte started on outside pole and was running in a tight pack of six racers, fighting for 3rd position. Unfortunately, at the end of the race, she received a 10-second penalty from the race stewards for a start-line infraction and was officially classified in 9th position. Overall, the Florida Pro Kart Series proved to be a great warm up for Charlotte in preparation for her challenge for several championships over the 2015 season. The start of the 2015 OGKC and the Briggs & Stratton WRS at Le Circuit Quyon is scheduled for May 3rd. Briggs & Stratton Weekly Racing Series – Confirmed for LCQ! Le Circuit Quyon (LCQ) is absolutely thrilled to announce that it has been confirmed as a participating track in the 2015 Briggs & Stratton Weekly Racing Series (WRS) by RLV! This is great news for LCQ, and fantastic news for racers participating in the Ottawa-Gatineau Karting Championship (OGKC)! The Briggs & Stratton WRS by RLV is a series established by Briggs & Stratton’s Racing Division, designed to promote, support, and give back to local racers competing in the Briggs & Stratton Senior and Masters Categories. The series is sponsored by Amsoil, Briggs & Stratton, and RLV Tuned Exhaust Products Inc. The WRS will enable racers in different regions to compete “head-to-head” for the top step of the podium, with three regional champions to be named in the United States, one regional champion to be crowned in Canada, as well as four top ‘206’ track awards. For the Canadian regional competition, Briggs & Stratton will be awarding over $13,000 in prizes to the top ten racers overall and the top ‘206’ track – that is a fantastic commitment to the Canadian karting scene by the sponsors of the WRS! Racers from WRS-affiliated tracks will accumulate points over the course of their racing season which will count toward the overall Canadian crown! LCQ is the home track of the OGKC, meaning that racers participating in the OGKC’s Briggs & Stratton LO206 Senior and Masters Categories will automatically be entered into the WRS! To ensure alignment with WRS requirements, all of the eligible races are to be held at the same WRS-affiliated track. The OGKC’s race dates for participation in the WRS are listed on the WRS-series website here. In 2012, significant infrastructure work was completed at LCQ enabling races of different track configurations, directions, and lengths, ensuring that all of the racing action is unique and interesting for racers and spectators alike! LCQ is completing even more infrastructure upgrades this year to support on-track activities and make the racing experience in Canada’s Capital Region even better than 2014 – this year is really shaping up to be a great one! For more information on the WRS and its rules and regulations, please visit http://www.BriggsWRS.com . For information on LCQ and the OGKC race series respectively, please visit https://circuitquyonblog.wordpress.com/ or the Ottawa-Gatineau Karting Championship on facebook!